With Illinoisans increasingly likely to move, Pritzker’s tax plan would send more moving vans toward the state line, and hit the gas. The Illinois Senate Executive Committee voted April 10 to scrap Illinois’ constitutionally protected flat income tax. Senate Joint Resolution Constitutional Amendment 1 could even allow for the same income to be taxed multiple times or for a corporate income tax in excess of 15 percent, which would make Illinois’ rates the nation’s highest. The measure opens the door for larger and more frequent tax hikes, but there have been recent claims that Pritzker’s graduated income tax hike would not result in more Illinoisans – particularly the wealthy – fleeing the state. Those claims are wrong. Illinois has suffered through five consecutive years of population loss and recently became the sixth most populous state. Prior analysis already revealed the culprit of Illinois’ people problem: migration to other states. Since 2011, Illinois has lost nearly 340,000 residents to other states, with the largest share of these migrants being middle-income families. While fewer high-income earners have fled the state than lower- and middle-income earners, that’s because there are far fewer high-income earners to begin with. When taking into account the relative size of each income bracket, the picture is very different. 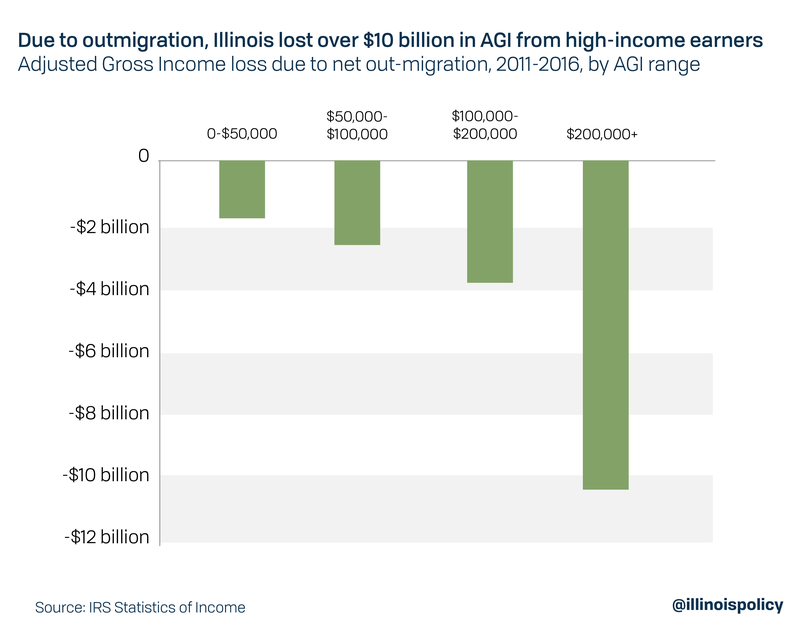 Since 2011 – the year the IRS began reporting migration by income level – net outmigration has been accelerating for all groups, with the group most likely to flee being the wealthy. It’s true that the $0-$50,000 income range saw the largest net loss in the number of filers in Illinois from 2011 to 2016. But in 2016, for every 100 filers in that bracket who left Illinois, 75 came in. Compare that with filers earning $200,000 or more: For every 100 who left, just 51 came in. The state’s recent barrage of tax hikes and deteriorating fiscal condition have accelerated outmigration for everyone, with wealthier earners reacting the most. Now, the governor is pushing to tax those most likely to leave even more, while claiming that no one will flee higher taxes. 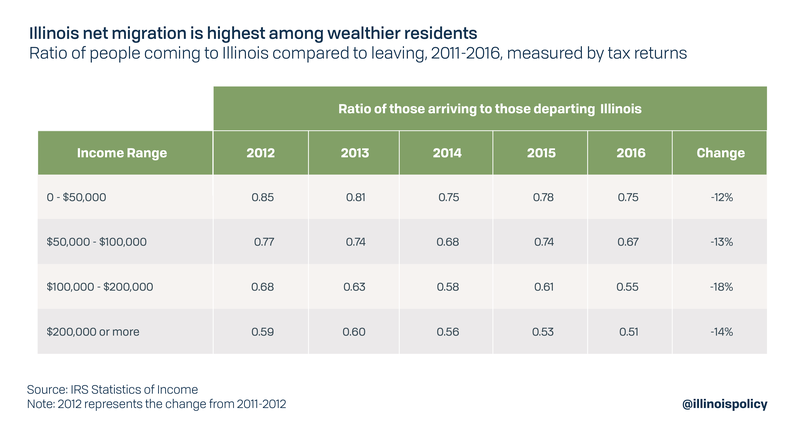 It’s also important to note which income group is driving the wealth flight from Illinois. Filers earning over $200,000 accounted for $10.6 billion in lost income from 2011 to 2016, or 55 percent of Illinois’ lost income. Pritzker’s tax plan relies on those taxpayers who are already most likely to flee the state for the bulk of his $3.4 billion in estimated new revenue. This is a reckless assumption. This phenomenon is nothing new: Illinois’ prime working-age share of the population has been declining for years. While the latest tax hike proposal in Springfield may promise illusory income tax relief for middle-income Illinoisans, the plan is projected to make Illinois one of the least friendly states for businesses and would reduce jobs. 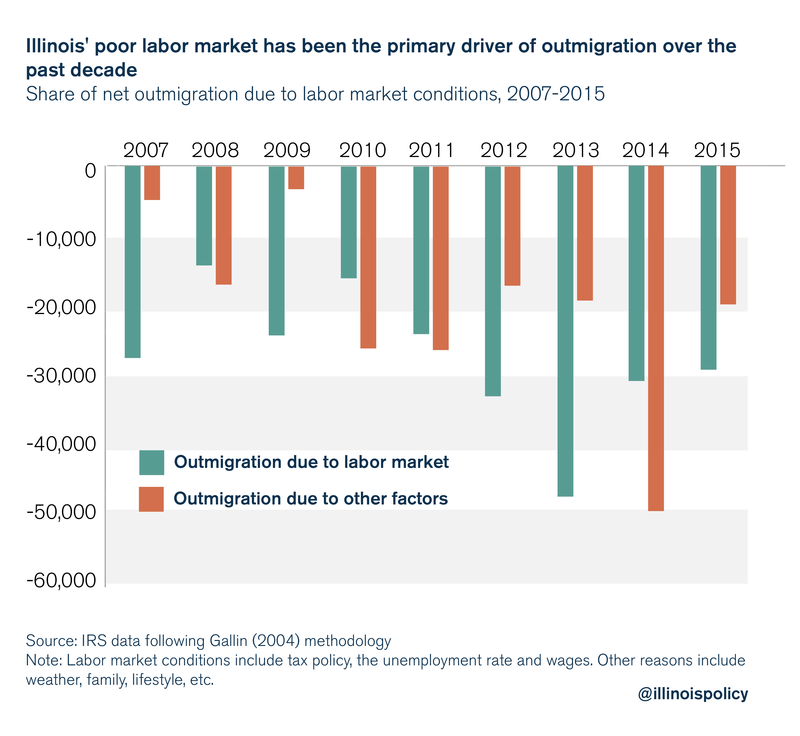 This is a problem for everyone, because there are nearly 300,000 Illinoisans looking for work and the primary driver of the outmigration crisis has been the state’s lackluster labor market (see appendix). With businesses and job creators being taxed at higher rates, it will be harder for everyone to find a job. More Illinoisans can be expected to leave at a faster rate. 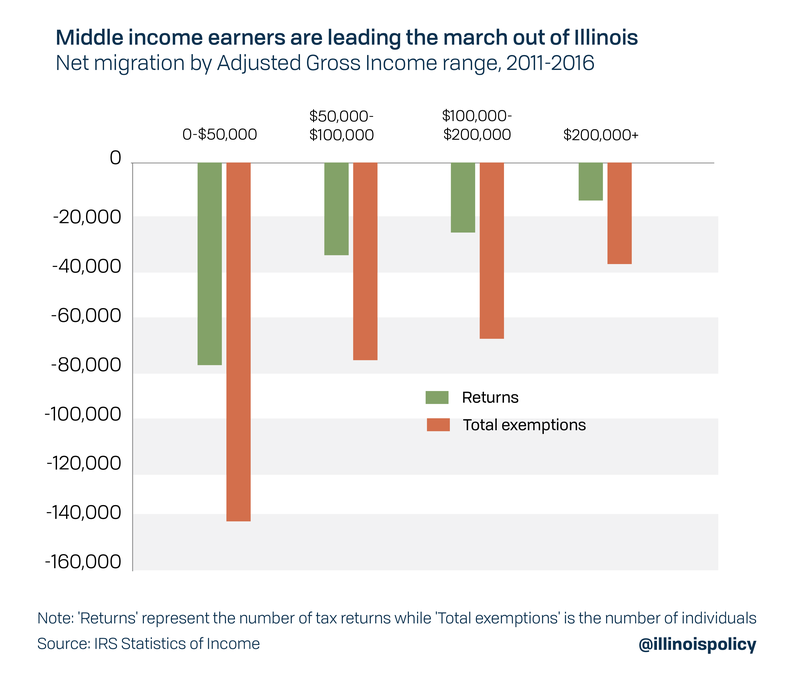 A graduated income tax will aggravate Illinois’ outmigration crisis. Illinoisans – and particularly those who Pritzker wants to raise taxes on – are already leaving at record pace. The proposal will raise taxes on small businesses, subjecting them to one of the highest tax rates in the nation, and will make it harder for struggling Illinoisans to find a job. When this happens, it won’t just be the wealthy who head for the exit. While the wealthy may flee the fastest, it will be the middle class who form the stampede.